Enjoy a truly unforgettable day trip from Reykjavík that combines the best sights along the South Coast and an easy kayaking tour. Your first stop of the day is at Sólheimajökull glacier. The spectacular Sólheimajökull is one of the most popular glaciers in Iceland to visit. During this tour, you can get away from the crowds and view the glacier features from a perspective that few others are able to enjoy. 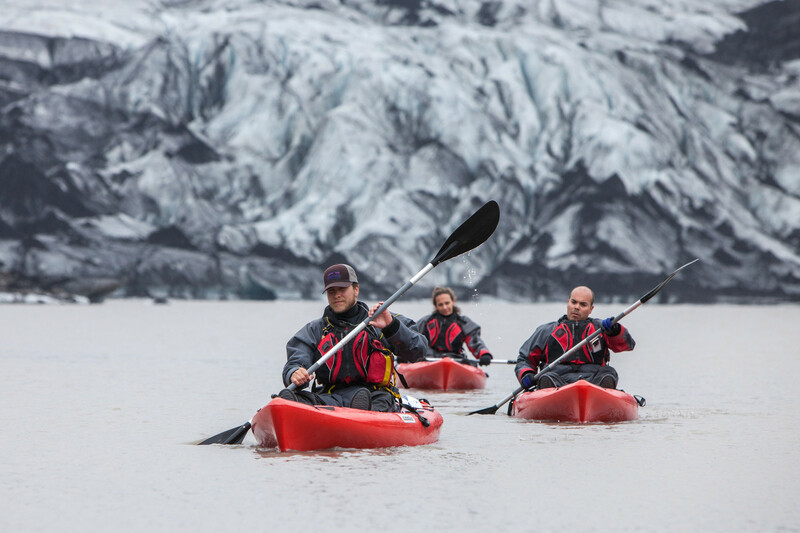 Paddling among the always-changing icebergs of this newly formed glacier lagoon gives you a first-hand experience of the massive glacial retreat in recent years. Our Sit-on-Top kayaks are very stable, and do not require prior kayaking experience. Before boarding, your certified kayaking guides will teach you the basic paddling technique and provide you with a dry suit. After being surrounded by spectacular icebergs on your kayaking tour, we take you to The Plane Wreck Shuttle to visit the DC-3 plane wreck, which lies close to the black beach. On our way back along the South Coast we head to the stunning 60 meters high Skógafoss waterfall. The final stop of the day is the equally impressive Seljalandsfoss waterfall. It is one of the best known landmarks of Iceland. It is 65 meters tall and it is possible to walk behind it in the summer. It is a great experience to see the waterfall from behind, especially on a sunny day when you can catch a rainbow reflection in the water. We recommend that you put your jacket on as you can get wet from the drizzle! Truly an experience of a lifetime which only few places in the world offer.